The magic here is the cauliflower is cooked twice. First, they’re baked, which makes it soft and creamy. Then, it gets battered and fried. The result is a crisp patty with a soft center – packed with buffalo flavor all the way through. The buffalo patties are served on a soft roll, topped off with fresh lettuce, tomato, red onion, and a drizzle of vegan ranch (I used JUST Ranch dressing). I don’t think I can over-state how amazing these are. I literately licked the plate clean when I finished mine. So, my personal assessment is these would be an awesome choice for someone who is reluctant to try anything vegan (or vegetarian, for that matter). Even if it won’t convert you, it’s a sandwich that’s definitely hard to argue with! Preheat the oven to 425 degrees and line a baking sheet with parchment. In a bowl, combine 1/2 cup buffalo sauce, 1 tsp. garlic powder, chili powder and olive oil. Dip each cauliflower steak in the sauce, letting the excess drip off, and place on the prepared baking sheet. Bake for 20 minutes, flipping halfway through and basting with additional sauce. When done, set aside to cool slightly. In a small bowl, whisk together the flax meal and 3 Tbsp. water. Set aside for 5 minutes. Heat the oil for frying to 360 degrees in a pan. In a bowl, combine the remaining buffalo sauce, remaining garlic powder, flour, water and flax mixture. Dip the cooked steaks in the batter, letting the excess drip off, and add to the hot oil. Fry until golden-brown, then transfer to a paper towel-lined plate. Serve cooked cauliflower steaks on a roll, topped with lettuce, tomato, red onion, and vegan ranch. Oh these would be a huge hit in my house! This sandwich looks amazing! I can’t wait to try it! These would be a great hit in this house. How do you think they would do in the air fryer? I remember when I first had buffalo cauliflower I was so pleasantly surprised how much flavor it had. Love the idea of it as a sandwich. Battered and fried cauliflower! Wow! it really does look delicious. 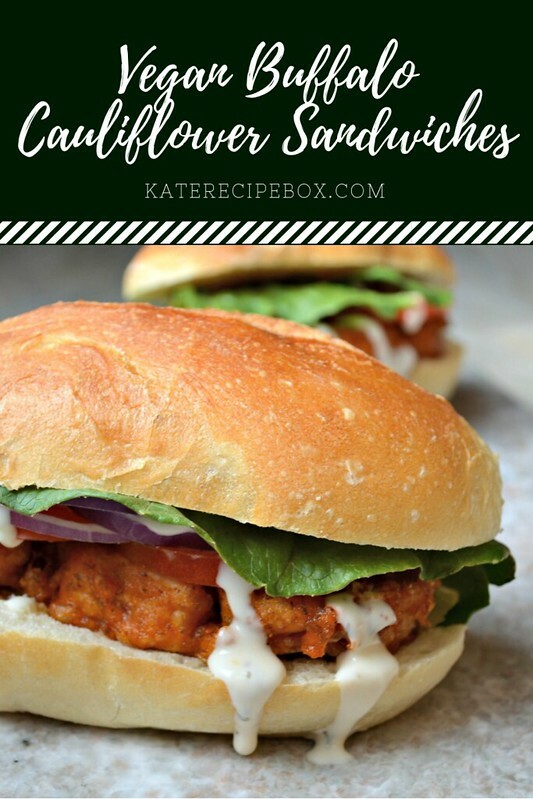 The perfect spicy sandwich for a casual weekend dinner! Oh my goodness, yum! I love buffalo cauliflower, but never thought to bake it before battering and frying it. 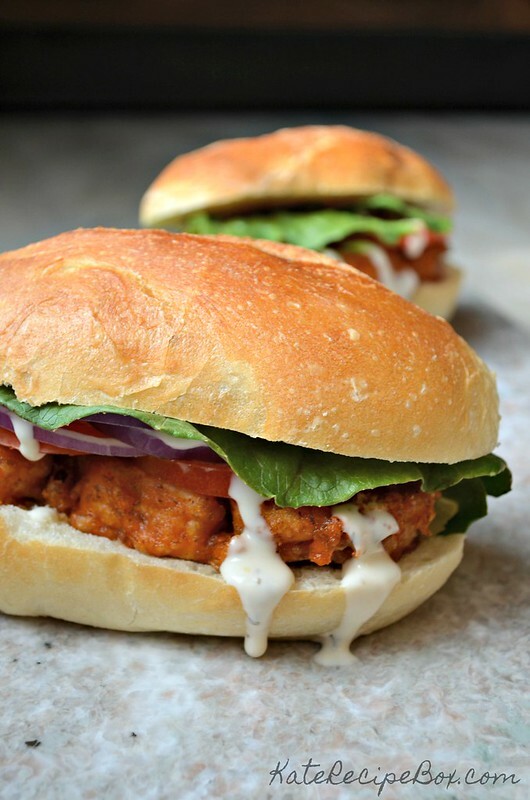 I am beyond excited to try making this delicious sandwich, thank you so much for sharing! Oh my YUM…this looks amazing. Forget the chicken, I’m all about this cauliflower!!! Yay for Veganuary! These sandwiches look amazing!! *-* I need to go get some cauliflower! This is such a great recipe! 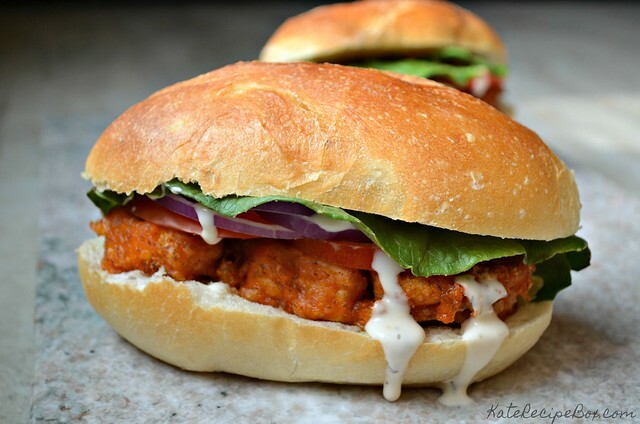 I love the textures and flavors of this sandwich! Never make a sandwich from cauliflower. Looks crunchy , yum and delicious. I seriously have to give this a try! It sounds delicious! I love buffalo anything, and I’ve had cauliflower on the to-try list for too long! What a great sammie! I love that its a veggie version. Perfect for lunch or a light dinner!